From casual to formal style, flats to boots, and everyday wear to “can’t-wait-to-take-them-off,” we all have shoes we love – and some that we could do without. Whether your collection is small and practical, average size, or it includes a pair for every occasion, season and reason, shoes can easily clutter your home when you don’t have effective storage. See how easy it is to improve the way you organize your shoes with these tips and ideas. 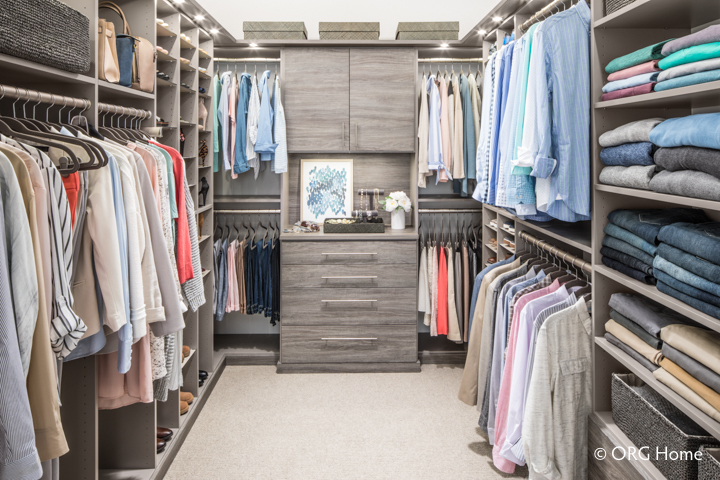 Take a few minutes to review your shoe collection and consider how much space you need to accommodate shoes– especially if you are sharing a master closet with your partner or have a family mudroom. 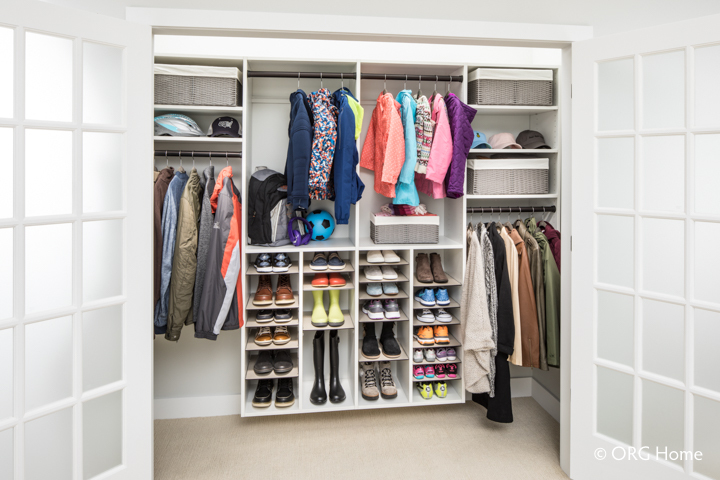 If you’re remodeling your existing closet or building a new closet space, this is the ideal time to pare things down. How much space will each of you need for shoes, folded clothes, hanging garments, and accessories? Keep what you love or like and donate the pairs you rarely wear. Do your precious pairs tend to pile up on the floor? When shoes are lying around, they can easily become lost, damaged, unsightly, or even create a tripping hazard. With shoe shelves built into your closet system, you’ll always know where to find your favorite pairs. Create a tall tower or multiple towers using adjustable shoe shelves to keep every pair up high, off the floor, and within easy reach. You can choose slanted shelves, straight shelves, or Shoe Shrine® shelves in steel or textured compact laminate. Slanted shoe shelves offer a durable surface and elegant shoe fences to help keep shoes in place until you need them. The slanted design makes it easy to see your shoes and put them away. Keeping shoes in their original boxes may preserve them, but it also keeps them hidden—and what’s the purpose of having a collection if you can’t admire what you own? Instead, opt for a storage solution that lets you showcase your footwear so you can appreciate them every time you open your closet doors. The Shoe Shrine’s low-profile shelving creates a clean, elegant look that lets your shoes be the focal point. Whether you’re getting dressed for the day or an evening out, keeping your wardrobe, shoes, and accessories visible lets you shop your closet and select what you want to wear with ease. With the open design of the Shoe Shrine, you can keep your whole collection on view so it’s easy to match a pair to your outfit, then simply grab and go. The joy of owning shoes is having a variety of options for every event – whether it’s work, play, dress up, dress down, exercise, errands – you name it. A smart organization system makes it easier to find the pair you need for any activity. Sort your shoes and store them in a logical grouping of your choice. For example, you might divide them by formal, casual, athletic, dress, or play use. Or organize by the color or height of your shoes. Place flip flops and flats together, store mid-height shoes in one section and heels in another, and group your tall boots in another section. Shoes come and go just like styles and seasons, so the ideal shoe storage solution should accommodate change. When the seasons turn and it’s time to switch out flip flops and delicate flats with boots or vice-versa, you’ll want shelving that adjusts easily without impacting your organization system. The flexible design of the Shoe Shrine makes it simple to add, remove or rearrange shoes as your collection evolves. Shelves are held in place with removable pins so you can move them up or down without tools. Shoe shelves, shoe towers, or adjustable shoe organizers are much more than just storage solutions. Taking time to organize your shoes by style, season, or family member and keeping them on display can make your life more efficient, your space more elegant – and your precious pairs always ready to wear.